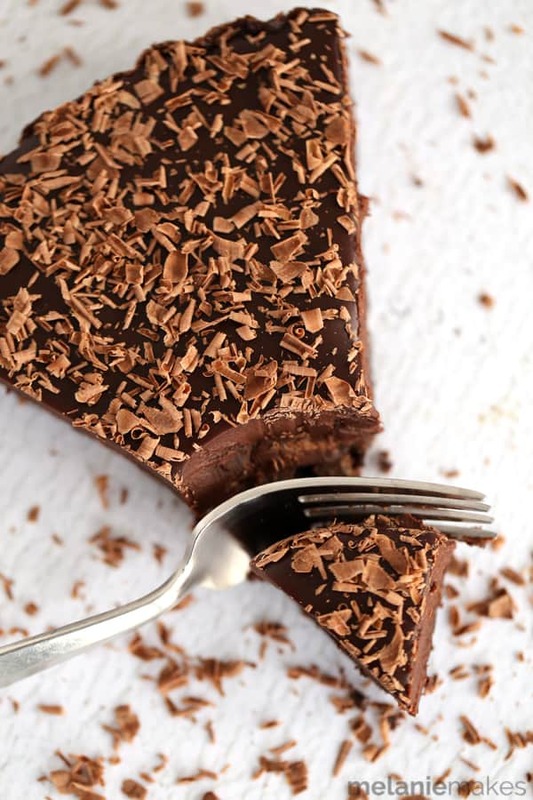 A brownie batter cookie crust is filled with a luscious chocolate ganache and the entire tart is covered in chocolate shavings. 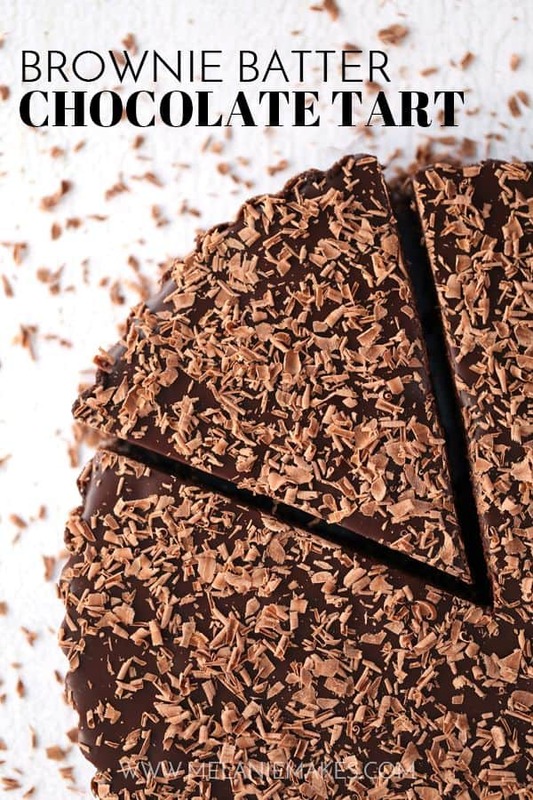 Rich and decadent, this Brownie Batter Chocolate Tart is the stuff that dreams are made of! Hello, Friday and hello weekend! Not only is it Friday which is always a cause to celebrate, it also happens to be the day before Valentine’s Day which is commonly referred to as Galentine’s Day – a day all about celebrating, supporting, and encouraging the ladies in your life. Definitely something I can get behind! I don’t know about you, but I can always count on my girlfriends to share a large slice of chocolate dessert with and that’s exactly what kind of recipe I’m sharing today. 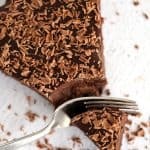 This Brownie Batter Chocolate Tart is a chocolate lover’s dream and was totally inspired by a new-to-me cookie find that I spied a few weeks ago during a grocery run. Brownie Batter flavored cookies? Is it any wonder that two bags instantly jumped into my cart? My mind was instantly spinning on what I could create using them and the thought of covering said cookies with even more chocolate seemed to be the only logical choice. Surely your brain works like this too, right? A brownie batter cookie crust is filled with my luscious Microwave Chocolate Ganache and because I like to make sure all my chocolate bases are covered, the entire tart is covered in chocolate shavings. 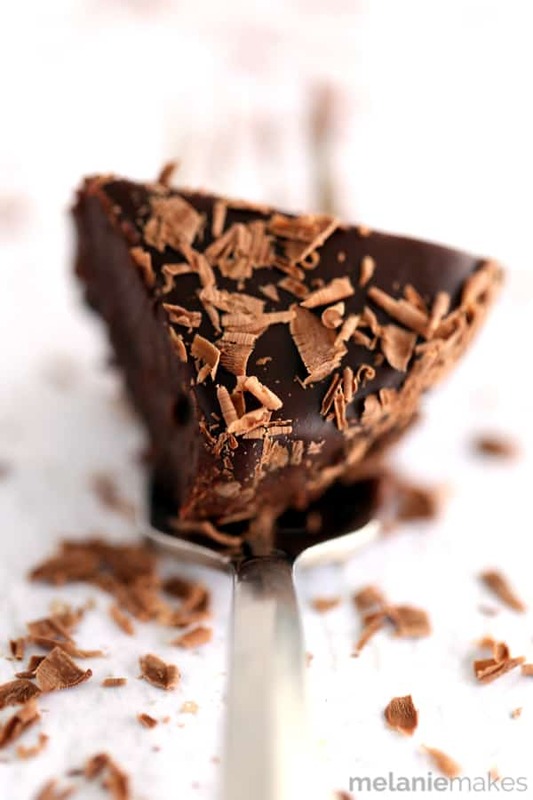 Rich and decadent this Brownie Batter Chocolate Tart is the stuff that dreams are made of! If you’re looking for even more decadent chocolate desserts, I have no doubt you’ll also be smitten with my crazy easy Black Forest No Bake Cheesecake and my must have Chocolate Pudding Fudge Cake. Add cookies to bowl of food processor and pulse until they resemble coarse crumbs. Add sugar, salt and butter to cookie crumbs and pulse until just combined. Press crumbs into 9" tart pan and place on baking sheet. Bake for 20 minutes or until set and allow to cool completely. In a microwave safe bowl, add chocolate chips and heavy cream. Microwave for one minute and then stir until completely melted. Pour into cooled tart shell and refrigerate until set. If desired, garnish with shaved chocolate prior to serving. If you aren't able to find the Brownie Batter Cookie Thins, you could also use chocolate wafer cookies as a substitute. Hi, Suz - I purchased them at a local grocery store but you can also purchase them online as well. OMGEEEEEE this tart is so intensely chocolatey andd perfect in each and every way! Cake batter gets all the love, but it's about time brownie batter is getting some attention. This looks absolutely fab! I wonder if brownie brittle would work for the crust? I'm definitely a brownie type of girl - move over cake! As for the brownie brittle, I'm thinking it would work as a substitute although it might be a bit "crunchier" than the crust using the cookies. Thanks so much, Krystle! Wow! This is over the top deliciousness! Love all the chocolate! Your pictures are beautiful. Thank you, Kathy - it's definitely perfection for a chocolate lover like myself! I love chocolate tarts! This would be extract good with nuts on the top! 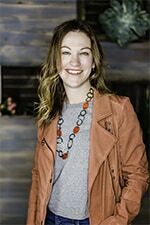 They definitely would add an extra texture, Shelby! Melanie this tart looks absolutely divine! It is so gorgeous and sounds delicious!! Thanks so much, Cate - so appreciate it! Melanie! this tart is crazy amazing!! love!! Hope you guys had a wonderful Valentine's Day! I'm really loving these photos Melanie!! I'm pinning these...again. They sound amazing! You're so sweet - thanks, Karen! Brownie batter flavored cookies?! Why haven't I heard of these?! And this tart!! I am swooning. Positively swooning over it! I know, right Angela?! Thank you! My brain absolutely works that way too! That is one gorgeous tart, Melanie! So glad I'm not the only one, Stacy! Oh WOW. This looks so chocolatey and rich! I'd love to share this tart at a girl's night! What gorgeous pictures, Melanie! Pinned! This would be perfect for a girls night, Jen! Thank you so much for your kind words. Can I invite myself over to eat some of this tart????? Absolutely! Although fair warning, our wind chill this weekend is -40. Dress warm for your trip! Oh my, oh my. I just stumbled onto your blog and this tart looks absolutely fantastic! I'm pinning it for sure. Going to check out your yogurt muffins, too. :) Thanks! So glad you happened to stop by! If you give the tart a try, let me know what you think! Same to you, Aida - thank you so much! Oh man does this look good! Your photos are fantastic. And I'm going to be on the hunt for brownie batter cookies now! Happy Galentine's Day! Thanks so much, Liz - I have a feeling I need to find some more of those cookies, stat! I may make a special trip back up to see you for this tart alone - I can't stop drooling! Please do, Heather - love that idea! This tart sounds heavenly! I need to keep an eye out for those cookies as I've never heard of them. Don't you love new foodie finds, Carla? Love that this one makes for one decadent dessert! Thank goodness its Friday huh!! This looks like the perfect Valentine treat. Yummy!! Pinned. Happy weekend! What a long week it's been, Cyndi - the perfect time to enjoy a slice of tart! I have a feeling if I found the brownie batter cookie thins I would be in big trouble because I would eat them all!! Your tart is absolutely gorgeous! I was in the same predicament, Shanna! Thanks so much for your kind words! Melanie! These photos are absolutely gorgeous - like works of art! I want to hang them up in my home but then I'll just be craving chocolate and brownies all the time. This tart is amazing. Happy Galentine's Day! You're so sweet, Nancy - thank you! So appreciate your kind words, Marly - thank you! My husband loves brownies. He would be all over this. I might just have to try this one out. Yes you do, Julia - the perfect dessert to enjoy while we're cooped up inside this weekend because of the cold weather! Brownie batter cookie thins? Hello! This looks luscious, pass me a big slice, please. Totally love this! It looks so decadent and delicious! So glad I'm not the only one that dreams of chocolate, Marla! Well give me a slice and I will happily go into a chocolate coma! I can't think of a better medical diagnosis, Kristen! So rich and beautiful! Happy Galentine's Day! This looks like pure heaven and so easy to make too. Thanks for sharing! Definitely an easy dessert option, Carrie! This is a show stopper! Looks fantastic! I love everything about this tart Melanie, it sounds amazing! Chocolate covered in more chocolate is definitely the logical choice for Galentine's Day. So glad you could join in this year! Thanks so much for including me, Courtney - so happy to celebrating with you! This brownie batter tart looks heavenly! Perfect for a treat this weekend. Oh, my gosh, Melanie! This is going on my baking list---what a splendid tart!! So happy to be celebrating Galentine's Day with you! Hope you had a wonderful Galentine's Day, Liz! 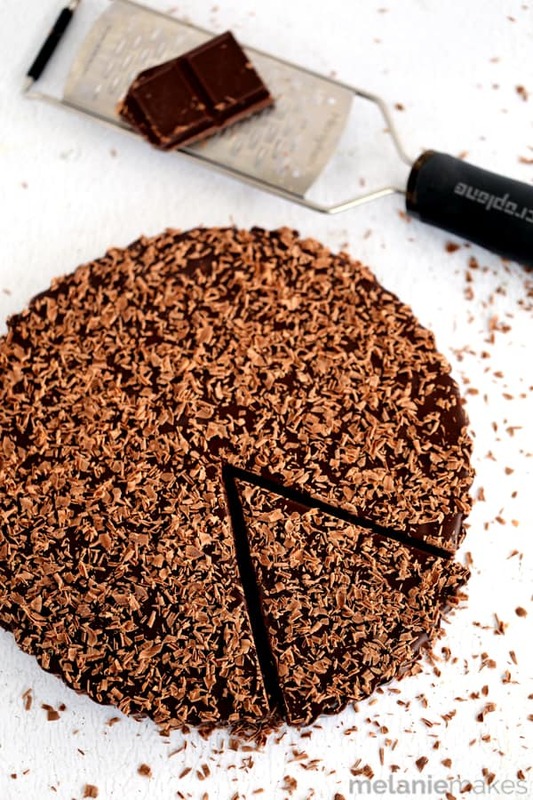 That shredded chocolate puts this already gorgeous dessert over the top! It's beautiful. I may be known to take things a bit over the top at times... Thanks, Julie! I'm a huge fan of Galentine's Day! Perhaps even a bigger fan of this incredible tart! You're so sweet - thanks, Taylor!